Stanley Gordon ’43 painted the portraits behind him in The Wallace Center of RIT presidents Paul Miller, M. Richard Rose and Albert Simone. 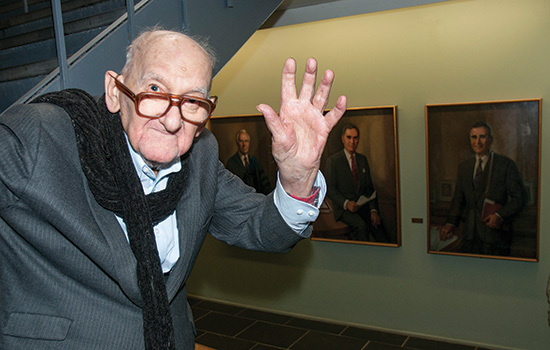 For seven decades, Stanley Gordon ’43 (art and design) brought people to life on canvas. He painted well-known Rochesterians, who sat for portraits in his studio on St. Paul Boulevard. He depicted religious leaders and United States presidents using photographs and images in his mind. More than 280,000 prints of a portrait he painted of Jesus with blue eyes are in homes from the United States to China. “I am known all over the world,” says the 94-year-old, leaning in closer to emphasize his point. And it all began when he signed up for night school in 1939 at the Rochester Athenaeum and Mechanics Institute, which later became RIT. Gordon says he was inspired to become a portrait painter by his uncle, Joseph Jablonski, an artist who graduated from Harvard in 1923 and later taught there. After completing courses at the Mechanics Institute, Gordon was invited to a summer class in the Adirondacks with prominent portrait artist Wayman Adams. That led to a job painting family members of a military commander and a job as a USO Camp Show sketch artist during World War II. He created charcoal sketches of 1,000 soldiers, which were mailed home to their families. Every portrait, Gordon says, has a story—and he is eager to share them. Rosalynn Carter introduced herself to Gordon in Washington, D.C., at a Gannett Company Inc. stockholders meeting (Gordon was given stock as payment for a painting). Later that evening he saw her standing alone and told her he had read that President Jimmy Carter wasn’t going to have a portrait done. When he saw her at the next meeting, he showed her a photo of the portrait. She liked it. The painting is now in President Carter’s presidential library, and Gordon keeps a thank-you note from Rosalynn Carter in a box filled with mementos. His portrait of John F. Kennedy, painted after Kennedy died, hangs in a high school in Bloomington, Minn., named after the president. Alumni of the school had seen a newspaper story about Gordon and his painting of Jesus and noticed the Kennedy portrait on the easel in the background. They tracked down Gordon and purchased it. As for the Jesus portrait, a businessman bought it and sold the thousands of prints. Gordon’s portraits of three RIT presidents, M. Richard Rose, Paul Miller and Albert Simone, still hang in The Wallace Center. Gordon says he is grateful to have had such a healthy and long career, which included teaching painting and anatomy at the downtown RIT campus for 25 years. He doesn’t paint much these days since he lost his sight in one eye. But he is still passionate about his craft. Gordon certainly has an eye for capturing the essence of people.